Lou Tweet and Dean Bob are friends, despite coming from families who are so different. Lou is the youngest of the seven Tweets and the only one who likes to be messy and impulsive. Dean Bob is the youngest of the seven Bobs and the only one who is neat and shy. Despite their differences, Lou and Dean are friends who walk to school together each day. But when their teacher announces the upcoming Pet Talent Show both kids are worried. Lou is worried the rest of the Tweets will come and sit in the first row too early. Dean is worried his family will make a mess and be too loud. And on top of that Dean has a serious case of stage fright. And indeed the day of the show, disaster strikes, and Dean and Lou need to find a way to solve the problem before the show turns into another Tweets vs. Bobs free-for-all. This series is quite funny with it's bright, colorful illustrations. But their is some depth here revolving around friendship and learning to get along despite major differences. The rhyming text makes for some interesting reading as well. 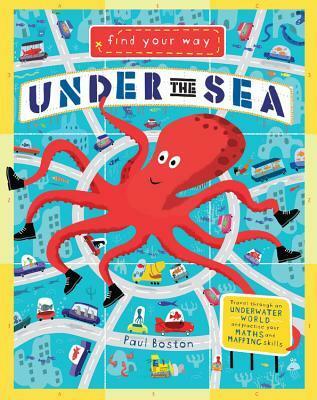 In this Masterpiece Adventure, the first in a companion series for younger readers from bestselling author Elise Broach, James is going on vacation for a week. His best friend, Marvin the beetle, has to stay at home. Without James to keep him company, Marvin has to play with his annoying cousin, Elaine. Marvin and Elaine quickly find themselves getting into all sorts of trouble—even getting trapped inside a pencil sharpener! Marvin misses James and starts to worry about their friendship. Will James still be Marvin's friend when he gets home or will James have found a new best friend? 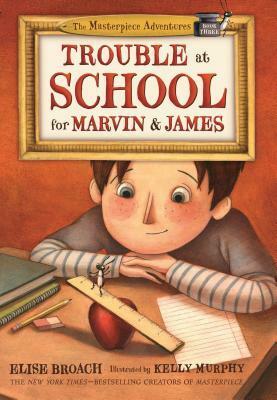 Trouble at School for Marvin and James is the third book in one of my favorite early chapter book series. In this adventure, James is heading to school and invites his friend, Marvin the beetle to come with him. Impulsively, Marvin agrees to go, wanting to see the art teacher James has been telling him about. And at first, Marvin has a delightful time as he helps James draw in art class and rides the globe in social studies. Lunch scares Marvin a little though with the noise and all the kids that he's afraid will notice him. When disaster strikes and he ends up in the trash, Marvin is afraid that he will never see James again. But with the help of a new friend, maybe he can find a way to make his way back to James. The illustrations break up the text beautifully, making the book seem shorter than it is. James and Marvin are great, likable characters that it's easy to relate too. The theme of mistakes sometimes leading to new learning experiences doesn't overshadow the overarching theme of friendship. This is a great series for young readers who are ready for more difficult text but still love plentiful illustrations mixed in. 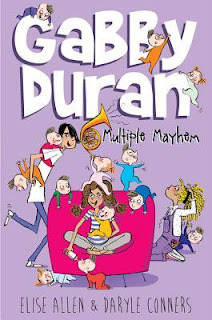 Summary: Gabby Duran, babysitter extraordinaire and modern day Mary Poppins was on her way home from sitting for a famous action's star's rambunctious triplets when she was approached by a mysterious woman (Associate 4118-23432B) with her first mission. A babysitting job with a more lucrative rate than she'd ever received. What child could possibly be so difficult to handle? Gabby was soon trusted with the truth--aliens are living among humans on Earth. They are protected by the top-secret organization, the Association Linking Intergalactics and Earthlings as Neighbors (hereby known as A.L.I.E.N). Even extraterrestrials need a sitter now and then. No one was up for the task except Gabby. After accepting the top-secret position, Gabby is paired up with her first charge, a little alien girl named Wutt from the planet Flarknartia,who turns out to be much more than meets the eye. The timing for associate 4118-25125A is less than ideal. It's a school day on Planet Earth and Gabby's audition for the solo part in the band is tonight. Can Gabby Duran, Associate 4118-25125A, First Sitter to the Unsittables, keep her otherworldly charge safe in the unpredictable halls of middle-school and keep A.L.I.E.N hidden? Our liaison, Edwina, informed Gabby that trolls love nothing more than a riddle-and stealing items from unsuspecting humans to add to their trove-but Gabby's certain that all this young troll wants is to have fun. However, it might not be as simple as she thinks. After all, there's a reason this particular alien offspring has been labeled "Unsittable." SUMMARY: Gabby Duran, Associate 4118-25125A, Sitter to the Unsittables, has proven herself an integral member of A.L.I.E.N.--the Association Linking Intergalactics and Earthlings as Neighbors. She has amassed an impressive roster of alien clients, and is a trusted babysitter among humans and intergalactics alike. We here at A.L.I.E.N. are proud to call her one of our greatest success stories, and believe she is ready to take on more responsibility. Making this highly unstable situation an even greater challenge? Gabby has also been assigned to protect a very dangerous object--one that, if it falls into the wrong hands, could cause the destruction of Earth itself. It remains to be seen whether Gabby and her friends are able to handle the demands of eleven . . . wait, twelve . . . no, thirteen babies, while ensuring the safety of the world at the same time. All we can do is wait, and hope, and trust. And ready our escape pods. There are a number of series about babysitting, the best known of which is probably The Baby Sitters Club, which I myself loved when I was younger. But none of those series are quite like this one. 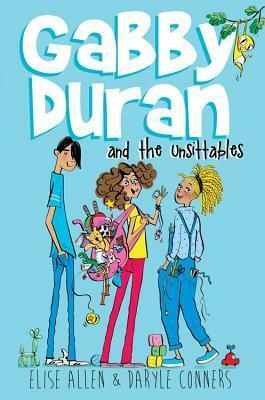 Gabby Duran is a fabulous babysitter, so much so that her clients range from ordinary middle class individuals all the way up to the President of the United States. Everything she could possibly need she carries in her purple knapsack. 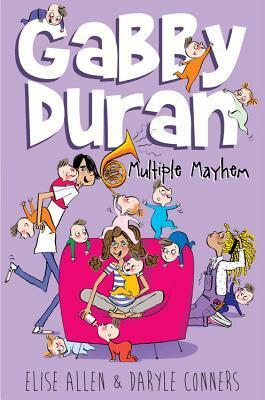 Living with her caterer mother and number genius sister, Gabby's life is good, except for her annoying neighbor, Madison. But things change dramatically when Gabby is recruited by A.L.I.E.N. to be a babysitter for alien parents disguised as regular humans. At first this seems like just another set of jobs, until Gabby realizes that not only are her alien charges are far more work than her regular human charges, but she's put herself into the middle of a war with an organization called G.E.T.O.U.T. who wants to weed out all aliens and destroy them. Calling all kidz! Do you like comics? Do you like laughing till milk comes out of your nose?! Look no further—do we have the book for you! 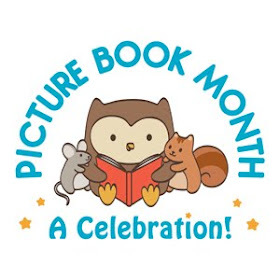 All your favorite comic characters are right here in one book, including the Peanuts gang, Babymouse, and Lunch Lady. 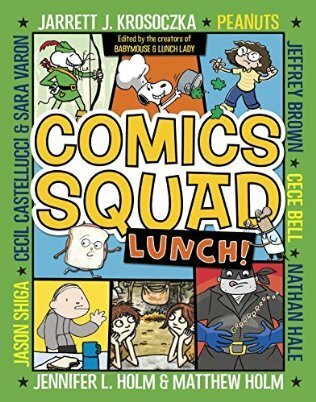 This all-star tribute to classic Sunday comics includes eight sidesplitting, action-packed stories about every kid’s favorite subject—LUNCH! Lunchtime can be fun, wild, yummy, or complete chaos! And in this second collection of comics, it is definitely hilarious. You will never look at school lunch again after reading this short stories. Whether it's an allergic reaction involving hallucinating classmates as food, or a World War II story about potatoes as weapons, Krosoczka and the Holms working with other talented graphic novelists have created another winning collection for young readers. My personal favorites were Lunch Lady as a girl facing off with a bully (hurrah for a bully story where the adults aren't missing in action!) and Snoopy in charge of the cafeteria (laughed my head off). There really is something here for everyone. Anyone who has experienced school lunch should get a kick out of these wildly unrealistic but thoroughly entertaining stories. There is even one story written as a choose your own adventure type (you have to follow the arrows) with multiple endings. 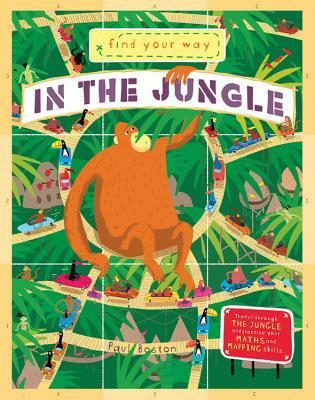 A great addition to most graphic novel collections, but only if you want to hear children laughing. 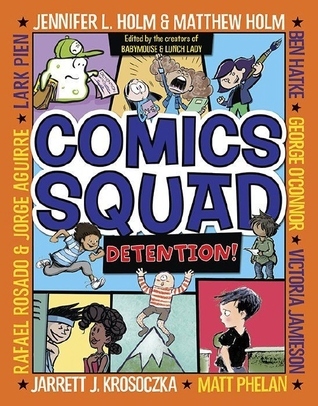 A comics collection from some of the biggest stars in graphic novels, including Jennifer L. Holm and Matthew Holm, Jarrett J. Krosoczka, and Victoria Jamieson! Calling all kidz! Do you like comics? Do you like laughing till you get sent to the principal?! Don t punish yourself! Read the next Comics Squad! Leave your troubles behind with this collection of quick and funny stories about many kids biggest fear detention! Sure, detention can be scary or frustrating or just plain boring, but who knew it could also be an adventure? With a disrespectful Greek god, antimatter ooze, bioengineered rats, and a school full of stampeding bulls, it is definitely full of fun! It s a bust-your-gut-laughing comics anthology with original contributions from the most beloved and bestselling names in graphic novels!" Never having had detention I was quite curious about how it would be depicted in these short comic format stories. 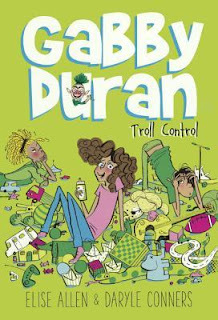 And of course all the stories are quite absurd, but thoroughly engaging and entertaining and bound to be enjoyed by many young readers. From a student expecting detention but being made a kindergarten helper to a Lunch Lady story to a girl trying to get detention so her crush will notice her, the stories here vary widely but are all amusing. From some of the best graphic artists currently doing children's books the reader should be able to find something he/she likes. My favorites were the story of the girl trying to get in trouble, made difficult by a rather clueless principal, and the Holm's Squish who is thoroughly depressed by having detention. 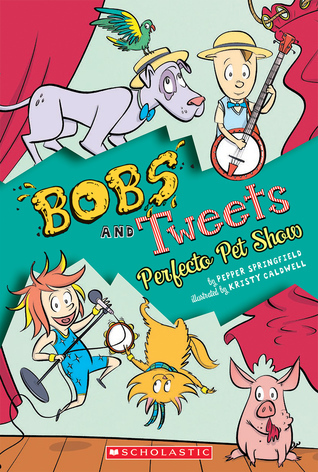 From Chris Grabenstein, the bestselling author of Escape from Mr. Lemoncello's Library and coauthor with James Patterson of I Funny, House of Robots, and Treasure Hunters, comes the second hilarious, fun-in-the-sun adventure in his new illustrated series about all the wacky things that happen when you live in a motel! There's always something wacky happening when you live in a motel, and P.T. (named after P. T. Barnum, of course) has grown up at the world's wackiest! When word gets out that the hottest teen idols in Hollywood (plus current YouTube sensation Kevin the Monkey!) 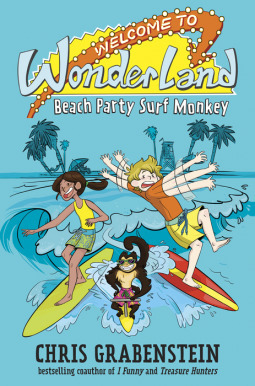 will be filming their next movie--Beach Party Surf Monkey--right in St. Pete's Beach, Florida, P.T. and his friend Gloria know that the Wonderland would be the perfect location. Now they just have to convince the producers! BONUS: Includes fun extras like P.T. and Gloria's Famous Fact-or-Fiction Quiz: Movie Edition. CHRIS GRABENSTEIN is the author of the New York Times bestselling The Island of Dr. Libris, Mr. Lemoncello’s Library Olympics, and Escape from Mr. Lemoncello’s Library, which was nominated for over 30 state awards lists! Follower him on Twitter at @CGrabenstein, and visit him online at chrisgrabenstein.com. Grabenstein presents readers with a very, wacky, but quite entertaining second book in the Welcome to WonderLand series. In the first book, P.T. the son of the motel's manager and grandson of the motel's owner, seeks desperately to find a way to pay back a large loan in order to save the only home he has ever known. With the help of his unusual grandfather and Gloria, a current resident of the motel who has brilliant business sense, P.T. sets out to earn as much money as he can over Spring break. Through a rather unusual (read impossible) set of circumstances, P.T. and his allies succeed in saving the motel. Now in book two, P.T. is once again tasked with saving the motel, this time from their ambitious neighbor who wants to expand his hotel onto the land where the WonderLand Motel stands. Once again, P.T. turns to his showman sense and his friend, Gloria's business sense to save the day. This time they bring in a movie to film at the WonderLand, hoping that this will bring the fame necessary to keep the motel booked. But of course, the path of showbiz doesn't run smooth, misbehaving actors, a missing monkey, and a neighbor willing to sabotage P.T. best efforts. But P.T. and Gloria aren't willing to give up just yet, but maybe they've bitten off more than they can chew. This is the sort of book that (especially for adults) requires a serious suspension of disbelief. But if you can manage to do that, you are in for a fun, creative ride. P.T. 's ability to tell stories is certainly matched by Grabenstein's.